is the largest "university's open doors" type of event organized annually at UPB. It attracts a large number of visitors from college graduates looking for a student position in one of the faculties of UPB (could have the flavor of research and student life), to simple families with children interested in tech research, industry partners, government representatives or stakeholders. Live experiments, presentations, networking and job fairs with UPB's industry partners are also part of the program. MicroDERLab and openenergyprojects.ro participated in the event with an experimental stand as part of the promotion campaign for all the current research projects. Flyers and general description of the project can be downloaded below [see Attachments]. "Analytical derivation of PQ indicators compatible with control strategies for DC microgrids," Proceeding of the IEEE PES PowerTech, 2017, Manchester. The latest version of the paper can be downloaded below. "Power flow formulation for LVDC microgrids with nonlinear load models," Proceedings of the IEEE ICDCM, 2017, Nurnberg, Germany. The latest version of the paper can be downloaded below. 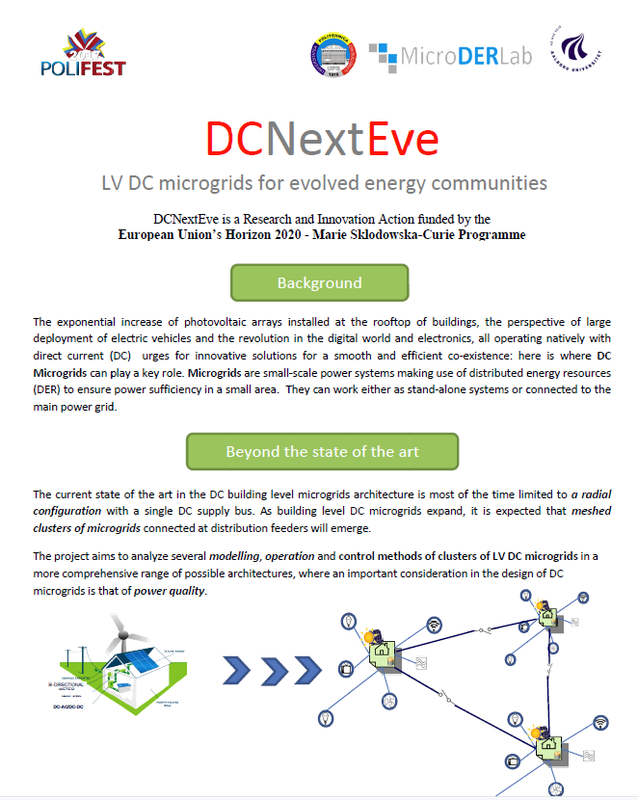 "Online optimization of a multi-conversion-level DC home microgrid for system efficiency enhancement", Elsevier Journal Sustainable Cities and Societies, vol. 35, pp. 417–429, Nov. 2017. The latest version of the paper can be downloaded below. "Business models for a campus-scale demonstrator for DC resilient communities", Proceedings of the European Conference Aachen DC Grid Summit, April 2018. Poster can be downloaded below. "Real-time optimal scheduling for prosumers resilient to regulatory changes", Proceedings of the IEEE EnergyCon Conference, June 2018, Limassol, Cyprus. The latest version of the paper can be downloaded below. "Adaptive distributed EMS for small clusters of resilient LVDC microgrids", Proceedings of the IEEE EEEIC Conference, June 2018, Palermo, Italy. The latest version of the paper can be downloaded below. Irina Ciornei is a Marie-Curie Research Fellow at Politehnica University of Bucharest and a previous Post-Doctoral Research Fellow of KIOS Research Center for Intelligent Systems and Networks. Irina holds a BSc (2002) in Power Engineering from the Technical University of Iasi, Romania, a joint MSc (2003) in Energy and Environment, one from the University of Poitiers, France and one from the Technical University of Iasi, and a PhD (2011) in Electrical Engineering from the University of Cyprus, with a thesis entitled “Novel hybrid optimization methods for the solution of the economic dispatch of generation in power systems”. At the last quarter of 2008 she was a visiting researcher at VTT Finland were she carried out a study on wind integration in the Cyprus power grid. In 2013 she visited IBM Smart Cities in Ireland working with the Optimization Research Group on a high-level design for optimal coordinated operation of water and power networks. Her expertise covers a wide range of analytical and heuristic optimization techniques (such as genetic algorithms, ant colony algorithms, particle swarm optimization, simulated annealing, and evolutionary computation) and stochastic optimization solutions with applications in operating systems under uncertainty. Her research interests include low voltage microgrids with a focus on DC microgrids, application of state of the art and novel operation research methods to the optimal operation of critical infrastructures, power system operation and control, RES distributed systems, integration of wind generation into the main power grid (reliability and feasibility), electricity market designs and operations. Irina is a member of IEEE, and a member of the Power and Energy Society. Irina is also the founder and advisor for IEEE Young Professionals of Cyprus. Prof. Mihaela Albu the founder of the MicroDERLab Group, is a Professor of Electrical Engineering at the Department of Electrical Measurements and Instrumentation, Faculty of Electrical Engineering, University Politehnica of Bucharest (UPB). She graduated (1987) from the Power Engineering Department of UPB and holds a Ph.D. degree (1998) from the same university. Her research interests encompass wide area measurement systems including synchronized measurements; smart energy grids including optimal use of renewables and real-time control; smart metering technologies; DC and hybrid microgrids; power quality and signal processing for power quality assessment, distributed and computer-controlled measurement systems, IEEE and IEC standards in power, and virtual and Internet-based laboratories. Prof. Albu was elected Vice-Chair of the Intellicis -Working Group 2: Reliable management and control of electric power systems, 2009-2013. The professional service is highlighted by active membership in IEEE - IMS, CIGRE, VDE, and IRE (Romanian Power Engineers Society). Dr. Albu spent a leave at Arizona State University as a Fulbright Fellow 2002 – 2003 and in 2010. She has been (2010-2013) VP of the IEEE Instr. and Meas. Society and is a member of the IEEE Smart Grid Steering Committee. She has also served (2013-2015) as editor of IEEE Trans. on Power Delivery and of the IEEE Power Systems Letters. Beside theoretical guidance, dr. Albu is versed in experimental work in DC microgrids. Dr. Albu has been advisor in several national and intern. PhD Committees and currently she is senior advisor for a postdoc project funded by EU Regional Funds with a subject in PQ control in LV Microgrids. Prof. Josep M. Guerrero is a Full Professor with the Department of Energy Technology, Aalborg University, Denmark where he is responsible for the Microgrid Research Program (www.microgrids.et.aau.dk). From 2012 he is a guest Professor at the Chinese Academy of Science and the Nanjing University of Aeronautics and Astronautics; from 2014 he is chair Professor in Shandong University; from 2015 he is a distinguished guest Professor in Hunan University; and from 2016 he is a visiting professor fellow at Aston University, UK, and a guest Professor at the Nanjing University of Posts and Telecommunications. He received the B.S. degree in telecommunications engineering, the M.S. degree in electronics engineering, and the Ph.D. degree in power electronics from the Technical University of Catalonia, Barcelona, in 1997, 2000 and 2003, respectively. Assoc. Prof. Juan C. Vasquez received the B.S. degree in electronics engineering from the Autonomous University of Manizales, Manizales, Colombia, and the Ph.D. degree in automatic control, robotics, and computer vision from the Technical University of Catalonia, Barcelona, Spain, in 2004 and 2009, respectively. He was with the Autonomous University of Manizales working as a teaching assistant and the Technical University of Catalonia as a Post-Doctoral Assistant in 2005 and 2008 respectively. In 2011, he was Assistant Professor and from 2014 he is working as an Associate Professor at the Department of Energy Technology, Aalborg University, Denmark where he is the Vice Programme Leader of the Microgrids Research Program (see microgrids.et.aau.dk). From Feb. 2015 to April. 2015 he was a Visiting Scholar at the Center of Power Electronics Systems (CPES) at Virginia Tech and a visiting professor at Ritsumeikan University, Japan. His current research interests include operation, advanced hierarchical and cooperative control, optimization and energy management applied to distributed generation in AC/DC Microgrids, maritime microgrids, advanced metering infrastructures and the integration of Internet of Things and Cyber-Physical Systems into the SmartGrid. He has more than 100 technical papers only in Microgrids in international IEEE conferences and journals. Dr. Vasquez is currently a member of the IEC System Evaluation Group SEG4 on LVDC Distribution and Safety for use in Developed and Developing Economies, the Renewable Energy Systems Technical Committee TC-RES in IEEE Industrial Electronics, PELS, IAS, and PES Societies.